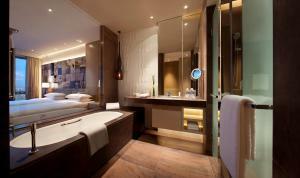 Offering a spa centre and sauna, Hyatt Regency Suzhou is located in Suzhou, 2.3 km from Jinji Lake. 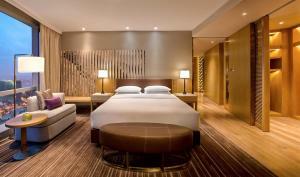 The hotel has a fitness centre and indoor pool, and guests can enjoy a drink at the bar. Free WiFi is provided throughout the property and free private parking is available on site. The hotel also offers car hire. 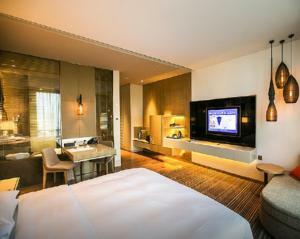 Guanqian Street is 9 km from Hyatt Regency Suzhou, while The Lingering Garden is 12 km away. 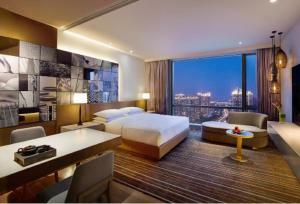 Hyatt Regency Suzhou is a 25-minute drive to Suzhou North Railway Station and Suzhou Railway Station. Guests can enjoy meals at the on-site restaurants. A flat-screen TV with cable channels, as well as an iPod docking station are featured. Some units include a seating area where you can relax. You will find shops at the property. Guests can find laundry and cleaning service at the property. Car hire is also available. Ticket service is available at the tour desk. Guests can also store their luggage at the reception desk. This twin room features a bathrobe, tea/coffee maker and flat-screen TV. This suite has a satellite TV, sofa and minibar. This double room features air conditioning, cable TV and iPod dock. This double room has a electric kettle, sofa and flat-screen TV. 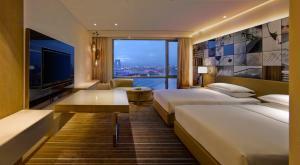 Rate: CNY 880.00 ... CNY 3850.00; select dates below to get current rates. 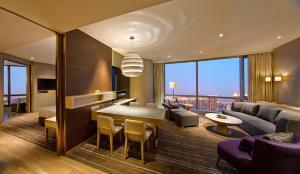 This suite features air conditioning, satellite TV and bathrobe. 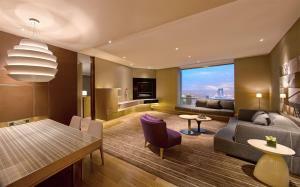 This suite has a tea/coffee maker, minibar and sofa. This suite features air conditioning, sofa and electric kettle. This twin room has a electric kettle, tea/coffee maker and bathrobe. 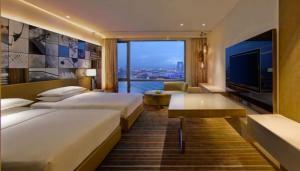 Rate: CNY 800.00 ... CNY 3850.00; select dates below to get current rates. This double room features a electric kettle, minibar and tea/coffee maker. This twin room has air conditioning, bathrobe and sofa. This double room features a sofa, view and minibar. This twin room has a electric kettle, sofa and air conditioning.